Perched on a bluff looking out across a bay at the long sandy strip of Chatham Bars and the Atlantic beyond, the Chatham Bars Inn belongs to the tradition of grand oceanfront hotels, its 217 rooms (78 of them suites) divided among the original 1914 inn and 28 cottages, some along the beach, others behind the hotel near the spa. Its an alluring setting to which the hotel adds an easy camaraderie fostered by gathering places like its South Lounge, Library, and Veranda, the latter a favorite locale for morning coffee or late afternoon cocktails thanks to that soothing eastward view. To check in is to relax. During the day the beach and pool draw crowds while others divide their time between the Spa and three Classic Clay tennis courts, the last laid out just to the south of the beach club and a short stroll from the beach. 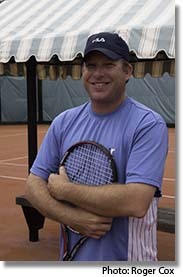 Tennis director Tucker Lang oversees the tennis program, which runs from Memorial Day into September, backed by an assistant pro for the ultra-busy July 4-Labor Day period. Together they run one or more adult clinics every morning—variously men's, women's, open, and Cardio—supplemented by afternoon junior clinics in age divisions from 4 to 12+. They also run one evening session for teens. Lang brings strong credentials to the position. After playing college tennis for Flagler College in St. Augustine, FL he taught at the IMG Bollettieri Tennis Academy, where he worked with top-ranked juniors and such pros as Maria Sharapova and Tatiana Golovin, before moving on to various resort positions, including the Resort at Longboat Key Club in Florida, where he teaches during the winter. Courts & Fees. 3 Classic Clay courts and a small pro shop. Court fees. $20/hour for guests; $35/hour for other. Beach. A quarter-mile of private beach along a bay fronts the resort. The Beach House and a family swimming pool are there, and water taxis—called "Bar Tenders"—are available to take guests out to the undeveloped oceanfront beaches on Chatham Bars, which is part of the Cape Cod National Seashore, and a place to occasionally find sunbathing seals. Golf Courses. the resort has not golf courses of its own but can get guests onto any of several nearby courses, including the 9-hole Chatham Seaside Links. Spa and Fitness Center. The Chatham Spa and its five treatment rooms are a 2-minute walk (or free shuttle) from the main hotel adjacent to an adults only swimming pool and a cluster of cottages containing rooms and suites. Spa-goers can elect to have their treatment outdoors in cabanas adjacent to the spa pool. Fitness Center. Located in the main hotel and accessible by room key 24/7, this modest mirrored interior room supplements its mostly cardio equipment (each with a TV screen) with a few Cybex workout stations and dumbbells. And ... Canoes, kayaks, and paddleboards are available for rent. There are several swimming pools at the resort, the largest of them at the tennis complex. Bike are available for rent. There are organized morning, afternoon, and evening programs from late June into September. The 217 rooms—of which 78 are suites—variously occupy the main hotel on one of 28 cottages arrayed along the beach and hotel. Some have gas-log fireplaces and balconies or terraces. All have rich appointments and amenities like Occitane toiletries and Nespresso coffeemakers. Their signature restaurant is STARS, a steak and seafood dining room distinguished by floor to ceiling windows on the sea. There's also a casual tavern, The Sacred Cod, the sand-front Beach House, and a limited menu on the hotel's front Veranda. Travel Instructions. The nearest major gateways are Boston's Logan International Airport(BOS) or T.F. Green Airport(PVD) in Providence, RI. Here's what others have had to say about Chatham Bars Inn.